In Strater 5, there are solid, stock, image, gradient, vector, and line fill styles. All of these can be edited in the new Fill Style Editor dialog. From this editor, you can edit any pre-existing fill styles, create your own custom fill styles, and layer different fill types on top of one another. Select an object with fill properties, or a scheme in the Scheme Editor, or open the Fill Style Manager (Home | Display | Fill Style Manager). Click the ... button next to the Style on the Fill page of the Property Manager or in the Fill section in the Scheme Editor, or click the New Style button in the Fill Style Manager. Click the + button near the bottom left corner of the dialog to add a copy of the selected layer, click X to delete the selected layer, and click the up and down arrow icons to move the selected layer up and down in the Layers list. The top layer in the list is ordered at the front, and the bottom is ordered at the back. A preview of all layers is shown in the upper left corner of the dialog. Select a layer in the Layers list and edit the properties in the section at the right. Changing the Fill type will change what properties are available. Note: certain fill types have backgrounds, so if these aren't the bottom layer in your list, make sure to decrease the background opacity so you can see the other layere through them. When you're done creating your fill, click Save to Style List to save the fill as a *.gsstyle file and apply the fill style, or just click OK if you don't want to save the style. If you entered the Fill Style Editor through the Fill Style Manager, give your style a Name and click OK. Select an existing fill style from the Style dropdown list on the Fill page of the Property Manager or in the Fill section in the Scheme Editor, or from the list of styles in the Fill Style Manager. Click the ... button next to the Style, or click the Modify Style button in the Fill Style Manager. Edit the style as in the previous instructions, and then give your style a new Name before clicking OK. You cannot save to the same name as the style you chose to edit. Once a fill style has been created, the properties for each layer are available individually from the Property Manager/Scheme Editor, so you don't have to re-enter the Fill Style Editor to change things like color and opacity. Editing properties in the Fill Style Editor updates the properties in the Property Manager, and vice versa. If you save a fill style to a *.gsstyle file, it will automatically be available to use every time you open Strater on that same machine. If you wish to send it to a coworker to use, you can find it in the directory: C:\Users\<username>\AppData\Roaming\Golden Software\Shared\Styles\Fill. Create the style in some program (either in Strater or in a graphic editing software). Export/save it to an image file (ie. JPG, GIF, BMP, etc.) or copy it. Load the image in Strater as a fill pattern. Click the ... button in the Style field in the Property Manager. Change the Fill type to Image and then in the Load from field, click the File button (if you exported/saved it) or the Clipboard button (if you copied it). If you clicked the File button, choose your image file and click Open. Click OK to close the Fill Style Editor and apply your fill style. In Strater 1, there are stock, vector, bitmap and picture fill styles available. 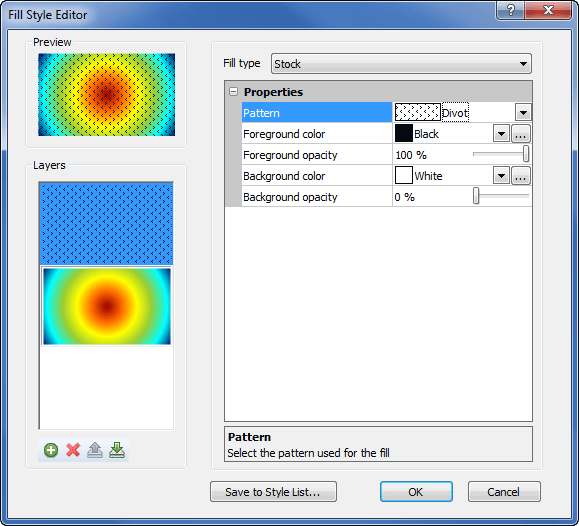 You can customize the vector and bitmap styles from the Custom Pattern dialog in Strater 1. Export a rectangle filled with that pattern from Strater 1 to an image file (choose an invisible line style for the rectangle) and use the Strater 2-4 instructions above to load the file in Strater. Take a screenshot of the pattern in Strater 1 and use the Strater 2-4 instructions above to load from the clipboard in Strater. Create an SDG file in Strater 1 with rectangles with the patterns you want, open the SDG file in Strater 5, and any vector/bitmap patterns in Strater 1 are automatically converted to custom image patterns in Strater 5. Recreate the custom fill style in Strater 5 and save it to a *.gsstyle file for sharing and for future use. Custom (loaded) image patterns are saved in the SDG file, so they show up in the Pattern palette when that SDG file is loaded, but not once you open or create a new Strater project. You will need to save the style to a *.gsstyle file to use it in other projects.